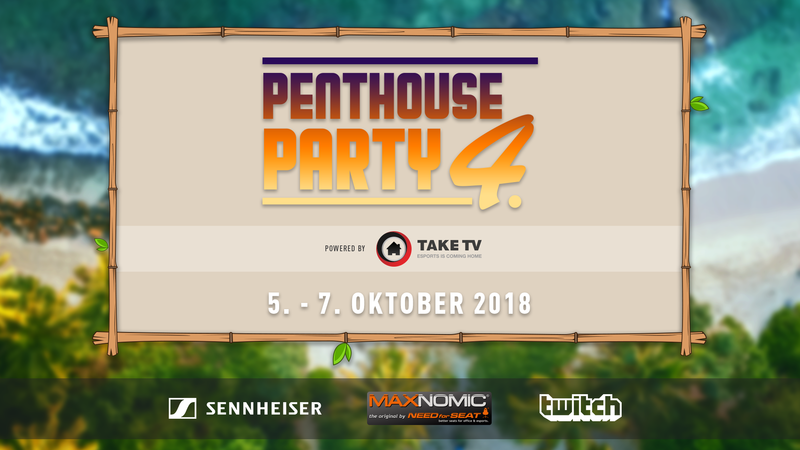 TaKe's Penthouse Party 4 is an online/offline event held on October 5-7, 2018 in Krefeld, Germany. Much is yet to be announced but in essence, 32 players will participate with most playing online while a few players will join NarutO, TaKe, RotterdaM and Wardi in the TaKeTV studio to play their matches. The party is sponsored by Sennheiser, MAXNOMIC and Twitch. The event was announced on September 19 in TaKeTV Facebook. I did not see a topic yet so here it is. I'll update the info once it's available. Each tournament day starts around 11:00 GMT (+00:00) and ends roughly at midnight. Event is played on Fri-Sun, October 5-7, 2018. Oh, created yesterday already. Thanks! I'm probably asking a stupid question but what's the practical difference between this, and a HomeStory Cup? The prize pool size? I'm sure it'll be sweet though so I'm tuning in. Thanks, I guess I should learn to read announcements. But I typically don't with TaKeTV stuff since I'm gonna watch it without worrying about details. I think the language of the main stream is also going to be german. I'm looking forward to it, these are always fun and I hope Bunny and Solar being in points towards them being at HSC aswell! €: actually since it says Wardii and Rotterdam are gonna be there maybe there's gonna be an english main stream? Serral confirmed and yay Reynor!!! I believe Wardi mentioned on his stream that the main stream would be in English. Great news, I imagined it would be the case when they talked about it during the last HSC. btw, Inno and more join the fun! Innovation, nice. I wonder which players will be there, since there should be huge lags for some players considering where they are from. I wouldn’t be too shocked if the Koreans got flown to Krefeld. I would, considering the prize pool. More players announced: Neeb, MCanning, Lambo, Zanster. Any news for the last eight players? Looking forward to this Friday already. INnoVation cancelled, but GuMiho is taking his place so all is well.